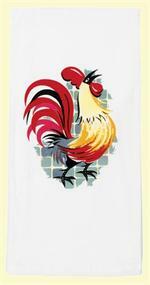 Classic Rooster Towel is 100 percent cotton in a soft flat weave. 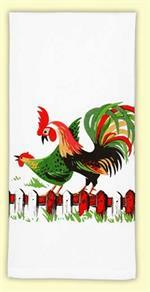 These have a red woven color border with bottom print of a retro country rooster. Looks great folded with border showing, or folded so just center panel is displayed. Measures 17" x 24"
Vintage-look, country-style flour sack towel with blue tile squares and clusters of bright red cherries. Measures 17" x 24". 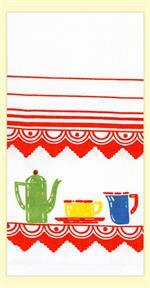 100% Cotton flour sack towel. 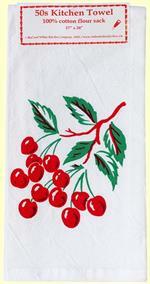 Vintage-look, country-style flour sack towel with red tile squares and clusters of bright red cherries. Measures 17" x 24". 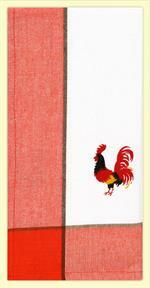 100% Cotton flour sack towel. 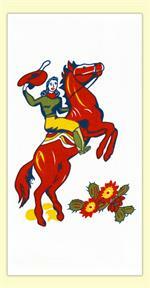 A fun, western themed towel featuring a 1950s Cowgirl on a rearing sorrel horse. 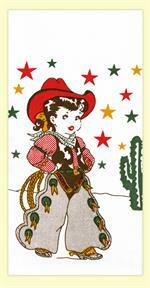 Perfect for rodeo or western themed retro kitchens. 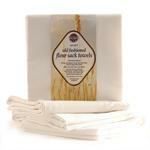 Flour sack towel measures 17" x 24". 100% Cotton. A friendly tiger striped, yellow and orange cat just passing bye. 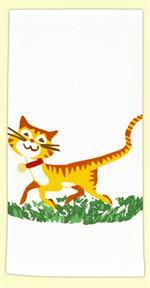 This happy cat is sure to brighten up your kitchen. 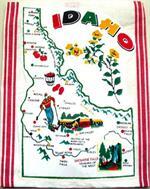 17" x 24", 100% Cotton Flour Sack Towel. New with tags. Outspoken little hen and her proud husband! 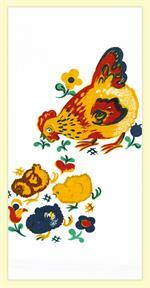 This vintage print of a country hen and her colorful rooster mate are sure to brighten up any country kitchen. 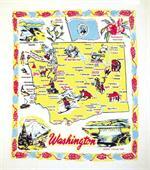 100% cotton flour sack towel measures 17" x 24". Brand New with Tags. 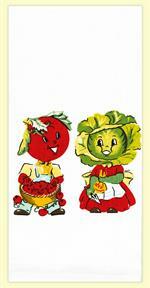 A delightful, farmers market inspired vintage print. 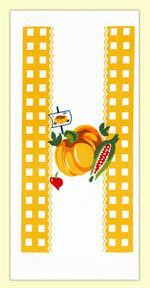 Features an orange pumpkin, surrounded by orange gingham print, fresh ears of corn, and a dainty radish. 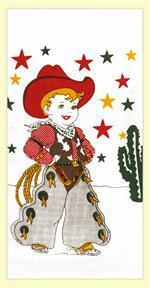 100% cotton flour sack towel measures 17" x 24". Brand New with tags. 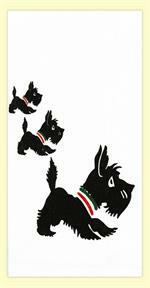 Three adorable Scottie Dogs decorate this 100% cotton flour sack towel. Towel measures 17" x 24". Brand New with Tags. 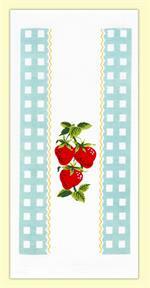 Vintage look kitchen towel features brightly colored red strawberries surrounded by a sky blue gingham check border. 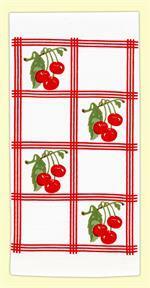 A cute addition to any country kitchen. 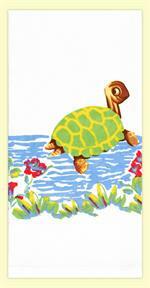 100% Cotton flour sack towel measures 17" x 24". Brand New With Tags.